Leaked spec sheet images reveal detailed info about the Galaxy S10 lineup. The images reveal the phone’s display details, memory/RAM configuration and more. Samsung will unveil its Galaxy S10 series of smartphones at its Galaxy Unpacked event on February 20. However, it seems that everything there is to know about the smartphones has leaked entirely ahead of the official announcement via numerous rumours and renders. 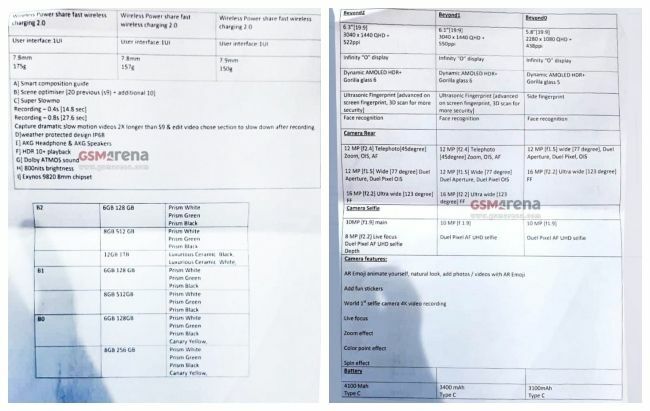 Now, GSMArena has posted images of two spec sheets that it says was received via email from an insider source in Samsung’s retail chain. These sheets reveal almost every specification regarding the upcoming phones. It mostly reiterate what we have already come to know from the ongoing rumours about the phones, like Samsung launching three phones, all of which will feature an Infinity-O display panel and support super slow motion video capture. 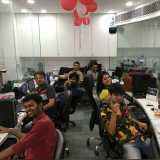 However, there are some additional bits of detailed information as well like the screen size of the phones, their camera configuration and more. The spec sheets lists the Galaxy S10 Lite, S10 and the S10+ as Beyond0, Beyond1 and Beyond 2. It mentions that the Galaxy S10 Lite will feature a 5.8-inch 19:9 AMOLED display with a 2280×1080 resolution, while the Galaxy S10 and S10+ could sport a 6.1-inch and 6.3-inch 19:9 AMOLED display with the same resolution of 3040 x 1440 pixels. While the Galaxy S10+ and the S10 are said to feature the latest Gorilla Glass 6 protection and an in-display fingerprint sensor, the company might equip the S10 Lite with a Gorilla Glass 5 display and a side mounted fingerprint reader to save on costs. Additionally, the three phones are said to launch running on the company’s Exynos 9820 SoC. The S10 Lite or the S10e, might launch in 6GB/128GB and 8GB/256GB models and is slated to come in Prism White, Prism Green, Prism Black and Canary Yellow colour options, which have been already been leaked. The standard S10 and S10 Plus are supposed to come in the same memory/storage variants but not in Canary Yellow colour option. The Galaxy S10+ is also listed with 12GB RAM/1TB storage option that could launch in Luxurious Ceramic Black and White colours. In line with previous rumours, the Galaxy S10+ and S10 are listed with the same triple rear camera setup, while the S10e is said to feature dual-rear cameras. The Galaxy S10 and S10+ are touted to feature a 12MP camera with f/2.4 aperture telephoto lens (45-degree), along with a 12MP sensor with f/1.5, 77-degree lens and 16MP fixed-focus f/2.2 123-degree ultra-wide camera. As for the Galaxy S10e, it could be equipped with a 12MP sensor with f/1.5 aperture regular camera and a 16MP secondary sensor with f/2.2 ultra-wide lens. On the front, only the Galaxy S10+ will reportedly feature dual cameras with 10MP + 8MP sensors, while the Galaxy S10 and S10e are said to share the same configuration of 10MP single camera. All the phones are listed with autofocus support and the capability to capture UHD images via the front camera. The Galaxy S10 Trio will reportedly support fast wireless charging 2.0, face unlock, scene optimiser with 10 new modes, super slow motion recording at 0.4s-0.8s that is twice the duration their predecessor supported, and could also come with HDR 10+ video playback support. Additionally, the phones are said to be IP68 certified and come with 800nits of brightness. The phones are expected to be launched running on Samsung’s new One UI. Finally, in terms of battery backup, the Galaxy S10+ is mentioned to feature the biggest battery pack of the three with a 4100 mAh capacity while the Galaxy S10 and S10e could be backed by a 3400mAh and 3100mAh batteries. While this is an extensive, detailed leak, no one can attest to the authenticity of the two images of the spec sheets. So, while these specs are mostly in-line with numerous earlier reports and rumours, we suggest that you wait for the official announcement by Samsung. However, we wonder whether there’s anything left for the company to announce about the phones on stage, except their price.